SAN DIEGO MOTORCYCLE ACCIDENT ATTORNEY REPORT — The motorcycle injury lawyers at Riderz Law have a tragic accident to report from San Diego that happened last Sunday evening. 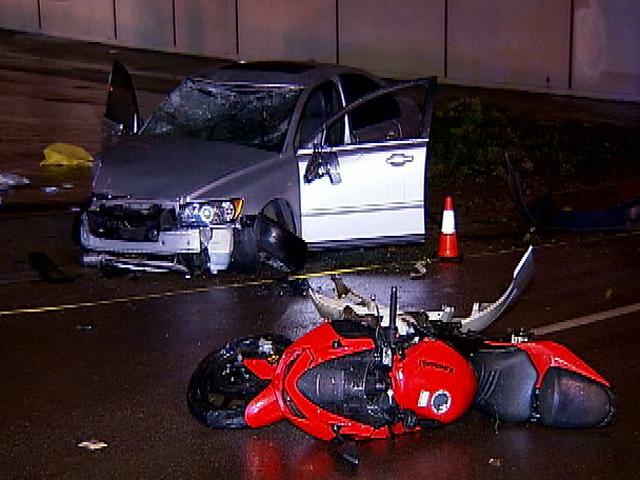 According to San Diego police, a 23 year old man in a Volvo rear-ended a motorcyclist and his passenger on a late-model sport bike, causing both car and motorcycle to crash. The motorcycle accident occurred on northbound College Avenue near Acorn Street. Authorities report that the man driving the Volvo had been drinking alcohol, and are investigating whether he was driving while under the influence. All three people involved in the accident were injured and hospitalized: the Volvo driver suffered the most serious injuries, with life-threatening internal trauma. The motorcyclist and his passenger both suffered broken bones. Our thoughts and prayers are with these individuals for a speedy recovery. We never wish any harm on anyone – including the driver responsible for this terrible accident. Assuming the driver recovers and it is proved that he was driving under the influence, however, we hope he is prosecuted to the fullest extent of the law. There is no excuse for recklessly putting other people’s lives at risk.